Wind Energy Technology students at Mesalands Community College, have their first look at the oil test set, recently donated by Megger. 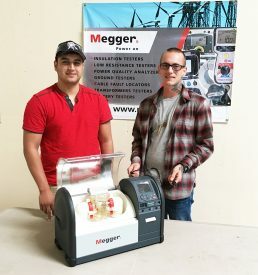 Mesalands Community College recently received an oil test set, worth $9,000 from Megger, a manufacturer of portable electrical testing equipment. This new equipment donation will give students in the Wind Energy Technology Program at Mesalands, another opportunity to utilize industry equipment and gain real-world training experience. “Megger is happy to help. Megger has had a strong relationship with Mesalands for years, and I am positive they will put the Megger equipment to good use,” said David S. Danner, Director of USA Distribution Sales for Megger. Andy Swapp, Wind Energy Technology Faculty at Mesalands, says he is truly appreciative to Megger and David Danner for their continued support. He said the new equipment will enhance the student’s hands-on experience in the operation, maintenance, troubleshooting, and repair of wind turbines, including the use of the College’s 1.5 megawatt wind turbine. Megger has been providing wind energy students at Mesalands with high-quality, electrical testing equipment, since 2008. Megger recently donated the DLRO200, a Digital Low-Resistance Ohmmeter to Mesalands.